The Esson surname has its origins in Mediaeval Scotland. The Esson name can be found spelled in many different ways, due to the many different scribes who recorded it over the centuries and the inevitable illiteracy of it’s owners for much of that time. The origin and meaning of the name remains the same however. Examples of common spellings include Ayson (as it was first recorded), Easson, Eason, Aesson, Asson, and Ison and many others. Today, in Scotland at least, Esson is the most common form. The name is made up of the Celtic first name Aodh, which meant fire, coupled with the English word “son”. It is a patronym, a surname indicating parentage, or descent from a single venerated person, in this case a person named Ay. Aodh was a very common Celtic first name, found in Ireland and Wales as well as Scotland. Examples include Aodh the Celtic god of fire, Aed King of the Scots and Picts in 871 AD, Aedh the last Abbot of Dunkeld and Earl of Fife, and Iye Mackay who was said by some to be the first chief of Clan Mackay. It was most likely pronounced with little or no emphasis on the final consonants, just as it is pronounced in modern Irish today, as “Eh” or Ay”. A slightly soft Scottish sounding “ch”, seems as if it might have rounded the name off. More poetically Aodh was one of the children of Lir turned into swans in an Ancient Irish legend. Understanding this, it is easy to see how the surname came to be pronounced as it was. The name first belonged to a notable family in Perthshire, In a charter of 1360 Robert, the 7th Steward of Scotland, later to become Robert II, King of Scotland, granted the lands of Fornochtis to an “Aythe filius Thome”. That is to say “Aythe son of Thomas”. The Abbot of Inchaffray Abbey witnessed that charter. Aythe himself witnessed a charter in 1365, in which he was described as Baillie of Stratherne. Aythe’s children and their descendants were given the patronymic surname Aysoune. These points are in the Scottish History Society’s book of 1908 called “The Charters of Inchaffray Abbey”. which, lists, translates and analyses many ancient documents from that source. Fornochtis is known nowadays by the name Fornought, A farm and a large house can be found there, just to the North of the A85, between Crieff and Perth. The ruins of Inchaffray Abbey area a short distance to the South. The family seemed to prosper, gaining other land including Ardonoquhay, Pettenzie, CultyBragan, Stix and significantly, Tulliemet to the East of Pitlochry. They appear in a variety of legal documents. 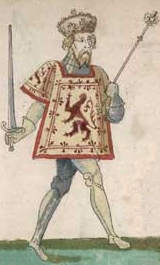 In 1483 William Aysoune, the 5th of Fornocht, took action against a Duncan Toisheach of Monzievaird, over inheritance and ownership of Petteny as it was then recorded. In 1496 William sold Cultybragan, and then Stix and Fornocht in 1594. He kept a life rent for the last two places for himself and his wife beyond that. Robert, William’s brother was at Tulliemet when he was granted a charter for Ardonoquhay on 14th July 1478. In 1479 he was sued for the rent of a third of the lands of Tulliemet. It seems at that time he was a tenant. In 1493 Robert then took a motley band of rascals (judging by their names) to court. It seems he bought cattle and horses from them which actually belonged to Coupar Angus Abbey, a big land owner in the area. Robert himself was being pursued for payment it seems and the court ruled the thieves themselves should pay him. It was not until 1445 when Aythe’s grandson was named in a legal document of indenture that the Fornochtis Aysounes were recorded as such. Much earlier in 1392 however, a person who was almost certainly related was recorded in a letter from the Scottish Parliament written on 25th March 1392. . The letter, written in Latin named “Johannem Ayson’ juvenem” or “young John Ayson” as one of the leaders of a band of about 300 men who carried out a notorious cattle raid, the Raid of Angus. (It is actually more helpful to us to think of this name as John Esson the younger. That is what was really meant and it gives us more of a clue what was going on, even if it doesn’t roll off the tongue so easily). In a bloody battle at Glasclune, a mile or two to the North West of Blairgowrie, the Sherriff of Angus, Sir Walter Ogilvy and 60 heavily armed knights tried to stop the raiders but were badly defeated. Ogilvy was killed and many of his men were killed or gravely injured too. The Raid of Angus was no ordinary cattle raid however, as it reflected a struggle for power and land between different members of the Royal Stewart family and their followers. The detailed story of the Raid of Angus and the complex events surrounding it are described here. One important question is “how sure can we be that John Ayson the younger was related to the Aysounes of Fornocht?”. The evidence for this is not explicit but nevertheless is very strong. John Ayson the younger must have had good standing, and reasonable wealth to be listed amongst the leaders of the Raid of Angus, alongside a number of notable men including the sons of Alexander Stewart, Wolf of Badenoch, nephews of Robert III. Robert II granted Fornochtis to the Aysoun family line, no doubt for services rendered. Robert II was the father of Alexander Stewart, the Wolf of Badenoch. Robert II seemed to strongly favour Alexander, bestowing on him much power and land. From the time of Robert’s death in 1390, Alexander Stewart’s fortunes started to decline and it was then he began his most vigorous and violent campaigns to re-assert his power. His sons and allies were in a similar position and felt obliged to strike back. John Aysoun the younger’s involvement shows that he had strong connections to Robert II’s favoured son, Alexander Stewart and his sons and allies. Skene in his book Celtic Scotland, Volume 3, of 1860 and Robertson in “The Topography of Scotland state that young John Ayson was from Tulliemet. We do not know the evidence they relied on, but nevertheless we have his view. We also know Robert Aysoun/Ayson from Fornochtis held land at Tulliemet from at least 1378 (as mentioned above). This again suggests a family connection. We furthermore know that Robert Ayson was a cattle dealer, not above buying stolen cattle for the court case of 1493 mentioned above. In The Red Book of Scotland McGregor states that Robert Ayson was the 1st Aysoun of Tulliemet. Given this person was there in 1378, he was obviously of a later generation than young John Aysons. This raises a question over Skene and Robertson’s assertion that John Ayson the younger was at Tulliemet in 1392. There could be many explanations for this however. To sum up, it seems extremely likely these people were members of the same family.. The evidence we have is not explicit but it seems most unlikely that two unrelated identically names families arose independently within 30 miles of each other at around the same time. They both had connections with Tulliemet, and with Robert II, or at least members of Roberts; family he favoured. John Ayson the younger would probably have been born around 1360 to 1370. That would make his father a contemporary of the children of Aythe son of Thome. It is not too great a stretch of the imagination to speculate whether John Ayson’s father was also a son of Aythe, son of Thome, and John Ayson a cousin, or even a younger brother of Robert Aysoun 2nd of Fornocht. Plausible though such an idea might be – it is only speculation. As time goes by in the 1400’s, and especially the 1500’s we see the Aysoune/Ayson name appearing more often across the Southern Lowlands. In 1511 we have a detailed record of a John Ayson apprenticed to work as a mason working on one of the early attempts to build a bridge over the River Tay at Dunkeld. The Aysons continued at Tulliemet, and it seems became more established. On 1st March 1542 John Charteris of Kinclevin, and John David and Thomas Charteris of Kinfawnis were “cautioned to underlie the law” for the cruel slaying of John Aysoun who was then Baron of Tullymet. Baptism records also start to appear. The conclusion seems to be this name arose in a single family grew and spread across Lowland Southern Scotland as the family migrated. While very plausible, the intention is that records will be collated to check this view. The first record we (that is I) know of for this family name in Aberdeenshire is a reference of 1675 to a Patrick Easson at Waulkmill in Tarland (about payment for wood mentioned elsewhere in detail). Closely following that is a baptism record in Clatt for 1677. There were clearly Eassons and Essons around in some, perhaps relatively small, numbers before that. It would be no surprise at all to learn there are earlier records somewhere too, although Aberdeenshire was not as prone to collecting records as places further South. John Esson * Tenant ..on “Laird of Skeen’s” land (the Skene’s owned much land and more than one farm in Coldstone from early times, including notably Watererne). This represents around 26 households, although subtenants are not named, and there would no doubt be more who were landless workers. If it is thought the name originated separately to those in Angus, the distribution could again fit with the idea the name arose where Gaelic and English coexisted for longest, close to the Highland Boundary. The “official “Highland border” today runs very close to ogie- Coldstone. If on the other hand it is assumed the name was carried by people moving from Perthshire and the South, perhaps we might speculate whether John Aysoun the younger went North when he was outlawed, to stay with the Stewart’s in their strongholds. The letter of Parliament warning people not to harbour the outlaws was sent to Aberdeenshire after all. Migvie Castle and Kildrummy were both castle’s held by Alexander Stewart, as the Earl of Mar. He was the brother or half brother of Duncan and Robert Stewart who were at Glasclune with John Ayson. He became Earl of Mar when he married Isobel Douglas the countess of Mar. The story goes that Sir Malcolm Drummond, Isobel’s first husband, was at Kindrochit Castle in Braemar having a tower added to the castle when he was kidnapped and thrown in the castle’s dungeon ten years after Glasclune in 1402. He died due to the rough treatment he received. The people responsible sounded much like those who had been at Glascune, a band of Catterans loyal to Alexander Stewart. This band no doubt included similar people to those the hard pressed people of Kinbattoch (which later became Towie) complained about to the Pope in 1402. (Vatican Papers). (Boardman mentions this in his book England and Scotland at War, c.1296-c.1513). Alexander Stewart went on to marry Isobel Countess of Mar in 1404, acquiring the Earldom of Mar, and ultimately, after securing it properly through the Crown, became one of the most well regarded of Scottish aristocracy, at least by the crown. He was credited with saving Aberdeenshire by defeating Donald, Lord of the Isles at Harlaw in 1408. He travelled to France where he no doubt learned much. He also continued to act like a bandit, even spearheading an upsurge in piracy from Aberdeen. Kildrummy is a ruin now, and Migvie Castle is scarcely visible, but in Mediaeval times they were both very important sites. Migvie, a couple of miles from Logie Coldstone and Tarland, was a notable place for some time. It was on an important route from Deeside to Strathdon, and meetings of Scottish leaders were held there. According to the 1845 New Statistical Analysis, the charter for the Castle also stated it was to receive feu-duties from Blelack estate, in what was later to be Logie Coldstone. Kildrummy Castle is a few miles from Auchindoir and nine from Alford. Given John Ayson was a described as a “leader”, it seems likely he had more people, possibly other Aysons,with him. Could one or more Ayson have moved to escape to escape retribution after Glasclune to follow Stewart or to settle and farm in this area? As stated, as things stand no Aysons or Essons were recorded in Aberdeenshire that this author is aware of. before the late 1600’s. There is little doubt that there were people of this name, possibly many in the county in these parts before that however. As time went by the Esson name appeared commonly in all parts of Aberdeenshire. Just studying one or two generations of one family shows how quickly people and the name could migrate. So far, detailed research for this web site has focused on the areas in Scotland mentioned above. The name appeared to the North of Inverness as Ayson, and in Caithness and Wick as Ison and similar from the late 1500’s. Notoriously Alexander Ysoun in Lapok, Caithness, and William Ysoun, his son, were slain by Sutherlands in 1566. William Ysone the younger, was recorded at Wick in 1622 and Agnes Isone in Thurso in 1662. In the Orkneys, a significant population of Eassons/Essons existed from early times too. Speculation on the origins there include the possibility the name arrived with Scandinavians settlers. Another school of thoughts suggests it arrived with fisherman who travelled up from mainland Scotland. It seems worth noting that the Orkneys, Wick and Caithness and Strathnaver to the North of Inverness were also Stewart strongholds. It seems reasonable to consider whether a strong association between the Stewarts and the Aysons influenced distribution of the name. It seems interesting and useful to bear such a possibility in mind, but best not to put too much weight on it. Research on Essons in England and Ireland has yet to be started. One suspects migration at significant times, but there is, as always, the possibility the name arose in these places spontaneously too. Time and research will reveal more about these places and the appearance of the name. The focus of this page and indeed this website are people whose name originated as a Celtic/English patronym as described above. Other possibilities for the names origins are possible too of course, and there may be many whose name whose name has a different background. Research does not suggest this to be the case as yet. Suggestions of alternative origins for the name include the arrival of migrants named after places in other countries, such as Esson in France or Essen in Germany. We see the names Van Esson, Von Esson and d’Essone at times. The name d’Essone is seen in England originating from Essone in France at times n history, and a general in Napoleon’s army had the name. These cases do appear nearly so commonly as Esson here however. Others have suggested the name could have arrived in places with Scandinavian settlers. So far alternative origins such as these do not appear to have become established. That is not to say they do not exist, or that they will not be found in time. We will see.